On July 23, 1998, Toronto messenger Wayne Scott made tax law history. For the first time a court decision made it possible for bike and foot messengers to deduct their extra food expenses as a business expense equivalent to "fuel". The court agreed with Wayne's argument that the extra food required by messengers to perform their jobs was similar to the gas required by car couriers to perform their jobs. The orginal court decision allowed couriers to deduct $11 per day as a fuel expense for food. As of 2008 the current deduction permitted is $17 per day. The automatic deduction is based on the number of days worked and it is not necessary to submit supporting receipts unless the courier attempts to deduct an amount greater than the daily limit. Wayne's battle with Revenue Canada took 18 years to succeed. He lost in Tax Court but appealed to the Federal Court of Canada where he was finally successful. The current limit amounts to a tax deduction for food of about $4,250 every year for every bike and foot messenger in Canada. Update 2008 - Couriers can now deduct $17 dollars per day for food costs without receipts. Update 2004 - Couriers can now deduct $15 dollars per day for food costs without receipts. Clause embodied in Report No. 4 of the Urban Environment and Development Committee, which was before the Council of the City of Toronto at its meeting held on April 16, 1998. Foot and Bicycle Couriers-Revenue Canada Taxation. The Metropolitan Cycling and Pedestrian Committee on February 23, 1998, recommended to the Urban Environment and Development Committee, and Council, the endorsement of the concept outlined in Mr. A.W. Scott s communication, dated January 21, 1998, that foot and bicycle couriers should be permitted to apply for business expense deductions for tax purposes for the extra nutrition over and above the norm required as a condition of their employment because this nutritional increment is the equivalent of fuel used by transport vehicles; and, further, that the Toronto Hoof and Cycle Courier Coalition be invited to make a deputation to the Urban Environment and Development Committee at the appropriate time. The Metropolitan Cycling and Pedestrian Committee reports, for the information of the Urban Environment and Development Committee and Council, having requested the Toronto Hoof and Cycle Courier Coalition to submit more detailed information. The Metropolitan Cycling and Pedestrian Committee had before it a communication dated January 21, 1998, from Mr. A. W. Scott, Charter Member, Toronto Hoof and Cycle Courier Coalition, advising that a federal hearing will take place in either late winter or the early spring respecting his request that Revenue Canada allow foot and bicycle couriers to claim as business expenses, the cost of monies spent fuelling their deliveries; and requesting the Committee to provide him with a letter of support concerning this matter. Mr. A. W. Scott, Charter Member, Toronto Hoof and Cycle Courier Coalition, appeared before the Metropolitan Cycling and Pedestrian Committee in connection with the foregoing matter. While I realize you must be swamped with loftier matters, it is our hope that you can find the time to consider the plight of my co-workers and myself. If, in so doing, you find any merit in our position, it is further hoped that you could provide us with a letter outlining your views on the matter. Our argument is a simple one: enviro-friendly couriers should not be taxed by Revenue Canada on monies spent fuelling their deliveries. That we are currently required to pay this levy on funds that logic recognizes as allowable business expenses, only creates an uneven playing field in our industry and rewards the comparatively irresponsible, motorized members of our fraternity. ! Here, despite years of lip service to the contrary, the Canadian Government tacitly encourages the unnecessary pollution of our cities. Foot and bicycle couriers keep this City moving and have done so for years. They are traditionally maligned, overworked and underpaid, often by the very people who rely on them for so much. Arguably the hardest-working, least-privileged segment of our urban work force, is it any wonder so many of these responsible young Canadians prefer to remain isolated from mainstream society. Here, I feel we all lose. I have asked for a federal hearing concerning this matter and have been informed that it should take place in either late winter or the early spring. Mr. Scott has been a courier for the past 15 years in downtown Toronto, which includes my Ward of Don River. Couriers, like Mr. Scott, are an important part of our community. They perform a necessary service that would otherwise have to be carried out by cars which would highly increase downtown congestion, noise pollution and emissions levels. In order to properly perform his job as a foot courier, Mr. Scott must consume quantities of food and drink over and above that of the average person, or even himself if he were in another line of work. Maintaining this diet is an absolute requirement of his job and, thus, is a necessary and extra expense that he would otherwise not have. I fully support his request to have this expense considered as a deductible business expense for tax purposes. "Bike couriers and walkers provide a vital service in an environmentally-friendly manner. They deliver packages throughout our city without contributing to our serious smog problem. They reduce the number of vehicles on our over-charged downtown streets while providing a competitive service. If every industry produced so little harm to our environment and contributed so little to our traffic problems, our city would be an even better place in which to live and work." (Communication dated July 16, 1997, addressed to the Tax Court of Canada from City Councillor Mario Silva, Ward 3, which was attached to the foregoing communication from Mr. Scott.) I am writing in support of Mr. Scott's appeal application to review income tax laws in regard to the propriety of setting expenses needed ta generate income to be set against that income for tax purposes. It is my opinion, shared with many of my political colleagues, that the service provided by cycle and pedestrian couriers is instrumental in moving the economy of the City of Toronto forward, without contributing to increased air pollution, traffic gridlock and ensuring a better quality of life for its citizens. To this end, all levels of government endorse and encourage greater recreational and business use of. bicycles to address these problems through policies such as dedicated bicycle lanes and other initiatives. In the course of their business, couriers spend most of an average ten-hour workday, five days a week on the road, and must, therefore, incur additional expenses for food and beverages. These expenditures would also be greater than that for individuals who work in other industries or businesses due to the nature that this work entails. It would only be fair and appropriate to permit couriers some allowance for this expense against their income, as is already permitted in other sectors. This would be in keeping with the efforts of all levels of government to further encourage the use of non-polluting ways of moving the economy of this city forward. Your consideration of my letter is much appreciated. If I may be of any further assistance in this matter, please do not hesitate to contact me. The following calculations represent the total distance of deliveries accomplished on foot, bicycle and public transit by Mr. Scott in the course of his 15-year career. These totals were arrived at by measuring each delivery on a map, point to point, with a kite string. The total length of the string was then applied to the map's scale to approximate the total distance that Mr. Scott efforts covered, had each delivery been laid out end to end. An average delivery length was calculated and multiplied by the total number of documented deliveries available. An approximation of undocumented distances was then conservatively arrived at. More than five times the equatorial circumference of the earth. 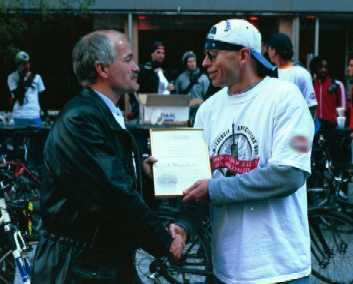 Mr. Alan Wayne Scott, Toronto; and Councillor Jack Layton, Don River.